My amazing artist friend Gentian from the blog Drawing With a Squirrel sent me this amazing care package of Daniel Smith Watercolor paints (and pens too!) that I had been wanting to try. In the tube, Daniel Smith Pyrrol Scarlet. I'm trying to find an alternative to my Holbein Cadmium Red Deep. Daniel Smith Transparent Pyrrol Orange - I was already using this one and totally loving it. One of my fav colors from Daniel Smith. 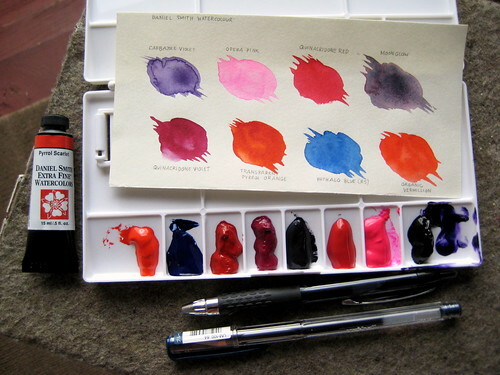 Daniel Smith Qinacridone Violet - Liking this.. need to compare to the violets I already have. Daniel Smith Moonglow - Unsure of this one.... Reminds me of Diamine's Damson ink. Daniel Smith Qinacridone Red - a pinky red that I'm totally loving! Daniel Smith Opera Pink - how can I NOT love this color! Daniel Smith Carbazole Violet - very, very purple. Uniball Signo 207 Black - Love the Uniball pens! Thanks so much Gentian- very grateful for the opportunity to play! I am hooked to my liquid watercolors but these sure look bright too!